Antonio Brown, the mercurial All Pro wide receiver who was traded from the Pittsburgh Steelers to the Oakland Raiders this week, made it known that he didn’t appreciate the fact that former teammate Ben Roethlisberger never wanted to workout with him in the offseason. 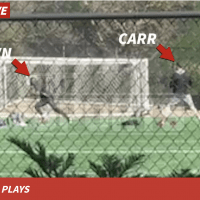 Derek Carr clearly heard that message loud and clear. TMZ has obtained exclusive video which shows the newly minted teammates working out at a park near the team’s practice facility in the Bay Area. 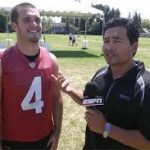 The Raiders gave third and fifth round picks to the Steelers plus have increased Brown’s three year guaranteed money from just under $39M to just over $50M, per Pro Football Talk. His time with the Steelers, while incredibly successful, may have come to an unpleasant end, but it seems he’s fully embracing his move to Raiders Nation and donning the Silver and Black.